Round Diamond Double Halo Two-Tone Engagement Ring | Shane Co.
As part of our exclusive Couture by Shane Co. collection, this stunning engagement ring setting features 144 round diamonds, at approximately .77 carat total weight, pavé-set throughout both the band and the double halo. The ring is crafted of 14 karat white and rose gold resulting in an appealing contrast of the ring. 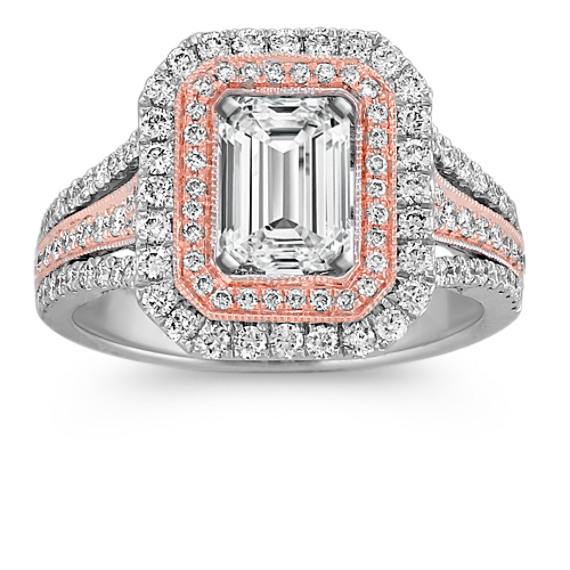 A 1.00 carat emerald cut diamond would be a lovely choice to complete this setting. Gemstone Carat Weight :.77 ct. t.w.